Built on a medieval Islamic fort, Madrid's La Latina neighborhood is the city's oldest—and one of its liveliest. 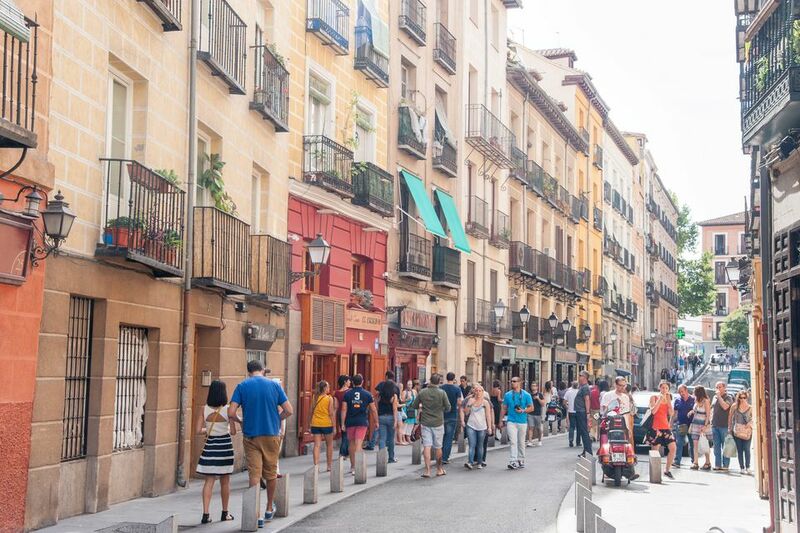 While La Latina is picturesque, with narrow streets lined with tapas bars and plazas punctuated by beautiful churches, this central Madrid neighborhood is modern and bustling, with no shortage of things to do. From the remarkable Goya paintings at San Francisco el Grande Basilica to the crowded El Rastro flea market, here are nine best things to do in La Latina. If you're looking for authentic Spanish cuisine, this street is the place. Calle Cava Baja is one of the neighborhood's most famous places to get food and drinks, and you'll immediately understand why once you take in this lively, colorful setting. Loaded with character, Calla Cava Baja also has plenty of different restaurants suitable for various budgets. Casa Lucas, for instance, is a highly-regarded wine bar that stays packed until late into the night, and Taberna Txakolina, a Basque-inspired bar, serves immensely addicting pintxos, or bar snacks. This landmark church dates back to the 1600s, and you'll feel transported back in time from the moment you step inside. Under its beautiful dome, you'll see stained glass, gold leaf, cherubs, and the tomb of the patron saint of Madrid, San Isidro Labrador. A visit will only take about 15 minutes or so, making it an easy addition to any travel schedule. Afterward, take a pit stop for some coffee in the plaza next to the church. If the Iglesia de San Andrés is peaceful and intimate, the Basilica de San Francisco El Grande is almost the exact opposite. Walk down Carrera de San Francisco and you will be greeted by this giant basilica, whose dome is said to be the biggest in Spain and the fourth-largest in Europe. The main draw here are the massive paintings inside, created by Spanish painters Francisco de Zurbarán and Francisco Goya. However, enjoying street performers and people watching outside are also great ways to spend an afternoon at the Basilica. One of Madrid's best-hidden restaurants, La Latina's Casa de Granada, has some of the best tapas deals in the city. Tucked into a nondescript building on Calle Doctor Cortezo and only accessible via an elevator to the sixth floor, Casa Granada is worth the trip for the prices alone. Once inside, you'll be rewarded with cheap jugs of sangria and an excellent view of the city from the rooftop terrace. The name comes from the Spanish word for "straw" (paja), which was sold for the mules who pulled carts back in the 13th and 14th centuries when the Plaza de la Paja was one of the city's main marketplaces. However, the shady, picturesque square is more of a peaceful place to take a break from the city these days. Also, the square is home to one of the best dining options around for vegetarians and vegans, Viva Burger. El Rastro is Madrid's Sunday morning market, which is arguably the most famous in the whole country. However, El Rastro is more than just a market; it's a day out. With restaurants offering good menus and street performers that entertain the shoppers, you can easily spend an entire Sunday at this attraction. The market's main street consists mostly of clothing, but if you duck off into the side alleys, you'll find an assortment of antiques and other curios. Because of its crowded nature, the market is a hotspot for pickpocketers, so keep your valuables close. Madrid's Calle de Segovia is one of the city's oldest streets, running parallel to Campo do Moro and up through La Latina before culminating at Plaza Segovia Nueva. The street is lined with plenty of restaurant and cafés, but one of the best reasons to walk along it are the impressive views of the Segovia Viaduct, an arched bridge that pedestrians can walk across. Be careful while exploring this street, though, as it's very steep. You won't be disappointed by the paella at this famous rice restaurant on Calle de Segovia. They can even prepare it—and many other dishes—for those following gluten-free diets. The rice and ingredients vary based on the season, but at any given time you can find classically-prepared paella with seafood, lobster, mushrooms, and more. In the summer, the restaurant has outdoor seating where you can people watch along the street while you enjoy your meal. This free museum in La Latina pays tribute to San Isidro Labrador, Madrid's patron saint, but the primary focus here is a comprehensive look at the city's history, dating all the way back to prehistoric times. The museum's permanent collection is just 153 pieces, but it offers an interesting look at Madrid's development. Additionally, the courtyard adjacent to the museum is the supposed site of a miracle: According to lore, this is where San Isidro saved his son from drowning when waters rose dangerously high. The museum's now made the site a focal point for visitors. Go Out for Beer at "los Barrios"
Going to the bar, known as el barrio in Madrid, is a time-honored tradition and popular pastime for the locals, and the La Latina neighborhood is home to some of its finest drinking establishments. Before you go out for a night of dancing, consider embracing the Spanish tradition of tapas and beer at one of La Latina's best barrios. La Musa Latina is a typical tapas bar near the Basilica de San Miguel with outdoor seating while Lamiak on Calle Cava Baja is a popular Basque-style restaurant amongst locals (few tourists go there).